I need to do some boss stuff. The work si slow and tedious and requires lots of effort, but I also need that culmination of fighting for the game. 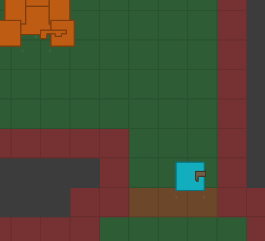 Without bosses, I will be missing something critical in game loop — there will be no “spike” in there, no focus to levels. 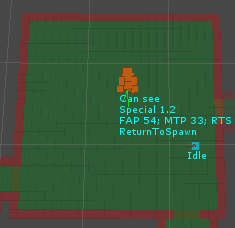 I will focus on specific abilities later; I need to add some crucial frameworks and interactions for now. 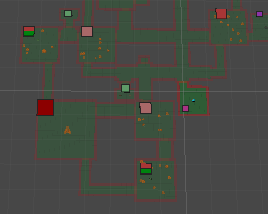 I have a lot of places in code I need to change things for this, especially for debug. But it’s all straight-forward, so it’s not too bad. 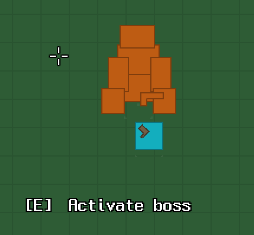 While regular enemies don’t fire while they move, I also made the boss fire when it moves (towards the player, around the player, or back to spawn, as long as they can see the player). I might need to tweak all of this further, but I am already setting myself some ridiculously high standards for these behaviours. The boss will also ignore any damage while sleeping, although I have no feedback for this yet. 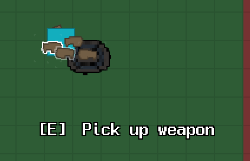 In fact, I can in the future add weapon stats to the pickup prompt as well. Or any other kind of information I need. But for now all I care about is that the boss gets activated on cue. Anyway, that’s about it for this entry. I already spent way too much time over several days getting the individual parts working. This makes boss encounters more “scripted” and so more of an event rather than the player just running through the rooms mindlessly. I’ve been working on boss abilities in parallel, so hopefully I can cover that too shortly.